The disgraced South Korean president, Park Geun-hye, has offered to resign and called on parliament to arrange her exit amid a corruption and cronyism scandal that has all but destroyed her administration. 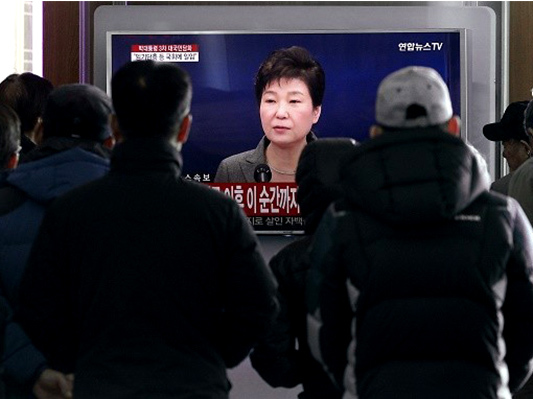 Speaking in a nationally televised address on Tuesday, Park – whose single five-year term will not be officially over until early 2018 – asked the national assembly to set a new deadline for the end of her turbulent presidency. The South Korean leader has faced massive street protests in recent weeks amid prosecution claims that a corrupt confidante wielded government power from the shadows. “I will leave to parliament everything about my future including shortening of my term,” Park said in her third public address since the scandal broke. “Once lawmakers come up with measures to transfer power in a way that minimises any power vacuum and chaos in governance, I will step down,” she said, as reported by The Guardian. The offer by Park, South Korea’s first female president, came after another weekend of huge protests in Seoul and other cities calling for her immediate resignation over her role in an influence-peddling scandal centred on her long-time friend Choi Soon-sil. Opposition lawmakers immediately rejected the offer, describing it as a last-ditch attempt to avoid the humiliation of impeachment.